We’re off to London for the Spring Bank Holiday weekend…It’s been three years since we were last down there, and it’s time to explore some new areas and attractions! It’s all new in that we’re staying in an Air B&B for the first time – a room in an apartment in Mile End overlooking Regents Canal – and we’re even getting a coach down with National Express rather than paying extortionate fares on the train! Here are 10 other new things we hope to do in our three days in London.. Designed by Sir Christopher Wren to commemorate the Great Fire of London, there are 311 steps for spectacular views over London. And apparently you even get a certificate for doing so…and I love a good certificate! London museums are huge, and we did a small part of the Natural History Museum a while back (where we were stalked by Russell Brand). This time we hope to pay a visit to the famous Victoria & Albert Museum – the current Pink Floyd exhibition is particularly appealing to Mr Fletche. From our room in Mile End we are a hop, skip and a jump from access to Regents Canal. It’s about a 9 mile walk from end to end, mainly along the canal towpath from Limehouse Basin to Little Venice. Not all of it is particularly scenic, but on the way we’ll pass through Camden Town, London Zoo in Regents Park and terminating at the waterside cafes and restaurants of Little Venice. The South Bank of the Thames in one of my favourite places in London to walk, soaking up the iconic skyline and taking in the bustling atmosphere. There’s street food, entertainment, art & culture, riverfront bars, book and antique stalls and skate parks. History and regeneration sit side by side. OK, so we’re going to the city but it doesn’t mean we can’t get out of the urban jungle and into the open spaces of Primrose Hill in North London. It’s also a handy short detour from the Regents Canal Walk and offers glorious panoramic views of the capital. If we haven’t found enough high places yet, there’s always One New Change Roof Terrace. It’s at the top of a shopping and office complex, free of charge to enter and offers glorious views of St Paul’s, The Shard and the London Eye, among other icons. And there’s a bar up there, so we could definitely kill two birds with one stone… And it’s open from 6am until midnight so I’m sure we can squeeze a visit into our schedule somewhere! Street art. Hipsters. Vintage shops and independent boutiques. Street food. It’s like my beloved Digbeth but magnified and moved to the capital. There’s also more bars, coffee shops and pubs than you can shack a (hipster) stick at. There is also a ping pong bar. This may be my spiritual home. How many of these do you think we can do in two and a bit days? 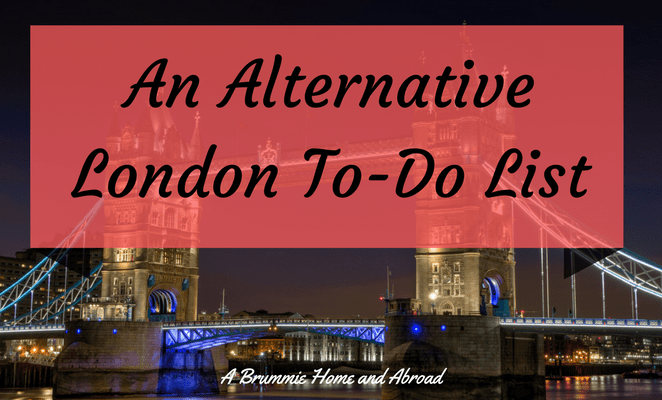 Keep your eyes peeled for an “Alternative Weekend in London” blog very soon! "Flash Fiction Foray 43: Skin"
Some great alternative ideas there! Going to save these for my London summer. The Sky Garden sounds amazing!